Sacrosanct is the largest deep space installation in the Purgatory Cluster and lies around 8 lightyears outside of the Venti system. The station is a large and ancient structure, with a barely maintained architechture. It is hard to determine exactly how old the station is, but it appears to have grown steadily in size over a period of several centuries. General estimates place the station at over a thousand years old, and suggest that it was probably constructed during the original colonisation of the Purgatory Cluster. Supposedly, some of this ancient arcitechture is still visible on its outer hull. Whatever the station's origins, it is now, and has been for centuries, a neutral ground and sanctuary for the Purgatory Cluster's many criminal elements. Over the years, the station has been expanded, modified, armed and upgraded by it's denizens to a truly remarkable degree. The station's hull is now 1.7km in length and appears to be constructed from a variety of common and exotic components, ranging from huge chunks of of generic scrap metal, to entire starship hulls. The structural integrity of such a station is generally considered unviable, but so far its denizens have proved particularly adept at maintaining it; although it is not uncommon for for entire sectors to vent atmosphere suddenly and at an alarming rate. In terms of order, Sacrosanct's population is as stable as their home's superstructure. Violence and crime is common, although 'gang' related violence is at a minimum thanks to the station's status as a neutral ground. While the station has no official government or police, it is generally ruled and maintained by elements of the more powerful criminal factions stationed there. Surprisingly, the widespread buying and selling of black market goods provides the station with an unexpectedly robust external economy. Sacrosanct's internal economy is one focussed on traffic flows going to and from the deepest heart of the maze-like station. The deepest regions are still reasonably ordered, as they are, apart from ad-hoc technology upgrades and repairs, still identical to the original, well-planed station Sacrosanct has grown around; such as the giant fusion reactors and the massive artificial gravity generators that provide most of the station with a down to feel superior to. The core also provide the backbone of predictability and stability that the rest of the station's infrastructure, severely lacking in these areas, has been built around. In exchange for these services, the core gets the raw materials, energy and waste-heat disposal services required to run. The middle regions contain the bulk of the industry and population, including massive life support complexes, industrial zones and habitation sectors, although after centuries of encroaching on one another they are often indistinguishable. Here the raw materials flowing into the station from the outer shell's trading ports are refined and fashioned into weapons, tools and supplies. Additionally the middle levels provide the station's food, water, air and recycling and homes for the endless masses of inhabitants. 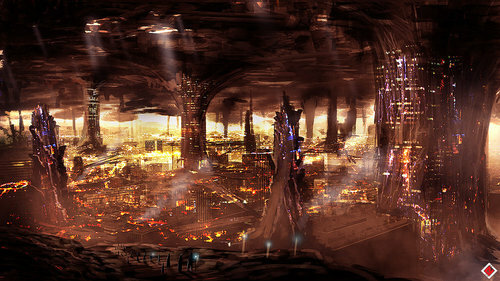 The outer shell consists of colossal waste heat radiators towering hundreds of meters above what is generally considered the station's outer hull, massive hangar bays to house the trading and mining vessels that sustain the station, and the countless markets, warehouses and auction centers that form the final word in trading in the cluster.